Mario has stolen the show often enough that it can be difficult to remember he even has a brother. As Nintendo celebrates the "Year of Luigi," though, Mario's gangly sibling is finally enjoying some well-deserved time in the spotlight. First there was Luigi's Mansion: Dark Moon for the 3DS, and now the less famous of the two Marios has found a starring role in New Super Luigi U, a retelling of the excellent Wii U launch title, New Super Mario Bros. U. New Super Luigi U works like a traditional expansion pack, offering content that builds upon a solid foundation and grows it in a new direction. Rather than simply offering new stages that feel like cutting room rejects, Nintendo has returned with a refined bundle of more than 80 new levels that essentially pick up where the last adventure ended. New Super Luigi U begins just like New Super Mario Bros. U, with Peach and her friends gathered around a table. Mario is absent, but his place is marked by his trademark red cap. Luigi and Peach's loyal retainers soon find themselves tossed to the edge of the Mushroom Kingdom as Bowser crashes the party with his huge airship and imprisons the princess in her own castle tower. Now the only way to save the distressed damsel is to make the familiar trek across a wilderness that has suddenly become much less hospitable than it was during Mario's last visit. 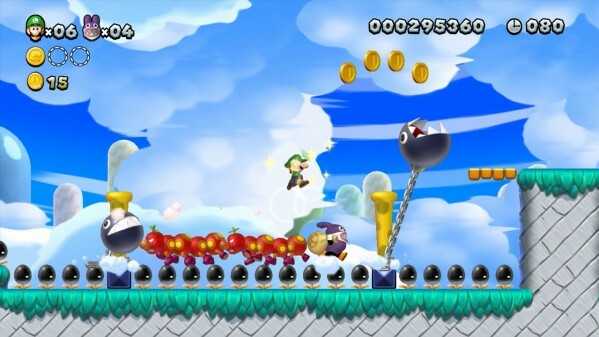 The new levels use the same general assets as New Super Mario Bros. U, so they feel very familiar, though the levels themselves are much shorter. That isn't to say they're easier, however, as the timer has been reduced to only 100 seconds. Spend too long negotiating an area and you'll frequently find yourself battling with time constraints. The clock doesn't quite ratchet the difficulty as high as, say, World 8 from the original Super Mario Bros. on NES, but this is as close as the series has come to that standard in long time. The more restrictive timer is understandable, given how compact the stages are, but it only accounts for half of New Super Luigi U's much more difficult equation. Stages must now be cleared in a single shot, without the benefit of checkpoints. Even the introductory stages can prove demanding, since a greater number of fatal hazards are now packed into smaller environments. Bottomless pits, lava pools, crushing columns, and cramped corridors are all common. Meanwhile, genuinely useful power-ups appear less frequently, often positioned in a way that allows a helpful mushroom or acorn to drop into an abyss before it can be grabbed. Those who relish demanding experiences will probably welcome the change and even view the occasional frustration as a personal challenge, particularly when playing alone. Friends, however, may not appreciate being invited to multiplayer sessions and spending half their time floating in protective bubbles just to avoid constantly falling in pits or losing fights with piranha plants and rogue Koopa Troopas. Of course, Nintendo has become very sensitive to concerns about difficulty over the last few years, and New Super Luigi U doesn't leave less skilled players in the lurch. In the past, it responded to these concerns with a golden tanooki suit that let players cheese their way through some of the more difficult scenarios. In New Super Luigi U, though, that mechanic is replaced by the option to play as Nabbit, the purple rabbit character that raced Mario through stages in New Super Mario Bros. U. Nabbit can pass right through many obstacles and enemies without taking any damage, and any power-ups he gathers are converted to 1ups once he clears a stage. Although New Super Luigi U is supposed to be Luigi's moment to shine, Nabbit can easily steal his thunder. Much like in Super Mario Bros. 2, Luigi jumps higher and slides more readily than Mario ever could, but those abilities pale in comparison to Nabbit's immunity to most attacks. Bottomless pits still pose a threat, but they're really the only hazard Nabbit has reason to fear. If you elect to cheap out with him, you can blaze through most areas and reach the closing credits after only four or five hours, though that estimate doesn't include the additional time that you might spend finding Super Luigi U's new secrets, which can be rather devious. For example, one stage forces the player to take a blind leap of faith across a wide gap, but that leap can only be completed if the player first grabs an invincibility star from earlier in the stage, then hustles over to the gap before its powers vanish. Series veterans might appreciate having to think harder in order to unearth every secret, but newcomers may reasonably feel that they are being left in the dust. The good news about Nabbit is that no one is required to use him unless you're playing with friends. A single player is expected to use Luigi, a perfectly agile hero who must rely on his jumping prowess and careful timing in order to safely reach the flagpole at the end of most stages. That the most satisfying way to play the game, but only if you're ready for a string of deaths that brings to mind early Mario games like The Lost Levels. If New Super Mario Bros. U left you wanting more, New Super Luigi U is a great way to add several hours of satisfying new platforming sequences to the mix, even if they do often feel rather abbreviated. The content does a good job of crafting exciting supplementary adventures using the familiar elements that worked so well the first time around, and now there's the added benefit of some genuine challenge. If you welcome that change, or don't mind using Nabbit as a means of survival, you'll find a lot to love. If you simply wanted more of New Super Mario Bros. U's expansive and relatively mild stages, New Super Luigi U may not be for you. This review is based on an eShop download of New Super Luigi U, provided by Nintendo. Jason Venter is a freelance game critic and the founder of the community reviews site, HonestGamers. You can follow him on Twitter at @jasonventer. Note: Joystiq does not provide star ratings for downloadable content reviews with the understanding that the quality of the core game's experience is unchanged from the retail release; See our New Super Mario Bros. U review.